This event is intended for last year undergraduate students, postgraduates, PhD students as well as all young researchers who work on topics of nonlinear dynamical systems and are interested in their applications to complex systems in many fields of science and technology. The participants will follow introductory lectures given by distinguished Professors and experienced researchers (School), while young researchers will have the opportunity to present their work in the form of short oral presentations or posters (Conference). The lectures will be two hour long and will be given in the morning and the research talks and laboratory sessions will take place after lunch (end of daily activities at 4:30 p.m.). 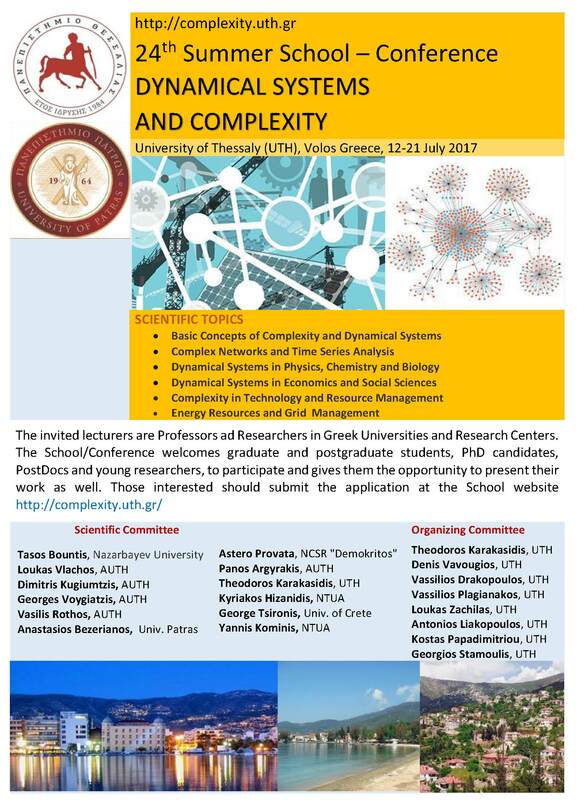 All lectures will be given in rooms provided by the University of Thessaly and there will be full technical support and internet access. There will be an effort for low cost accommodation for students.